Infrequently Asked Questions: What's the point of spires on skyscrapers? Prominent modern skyscrapers, ranging from One World Trade Center to the in-construction Comcast Technology Center, all seem to don those sky-reaching spires that may be pleasing to the eye, but don't have an obvious reason to exist. What gives? In search of an answer, we reached out to Abieyuwa Aghayere, a professor in Drexel University's College of Engineering's department of civil, architectural and environmental engineering. When were spires first introduced to skyscrapers? The first significant use of spires in the U.S. was for the Chrysler Building, circa 1930. What was the original purpose? Was there one, or is it a vanity thing to make it taller? There are a variety of reasons for the use of spires, and spires also vary in shape and height. Architecturally, it functions like a “hat” on top of the building which caps off the otherwise unimpressive flat-roof in a more elegant and aesthetically pleasing way. The section between the top of the flat roof and the tip of the spire could serve multiple purposes while also maximizing the bragging height of the building. The spire could serve as a communication tower, or a lightning rod, and the flat roof area could also be used as a public viewing deck with the tapered spire serving as a guard rail or balustrade. It could also be used to store or hide mechanical equipment and hardware such as tuned mass dampers (TMD) – that are used to control the lateral sway of super-tall buildings to prevent motion sickness of occupants. Who was responsible for designing the spire? The shape and height of the spire are typically determined by the architect, but the attachment of the spire to the top of the building and designing for any additional forces exerted on the building by the spire -- and the forces on the spire structural elements themselves -- is the responsibility of the structural engineer of record. Are there different design types of the spire? Depending on the building and the architect, the spire designs vary. Structurally, does the addition of a spire actually change the integrity of the building at all? It does not necessarily add to the structural integrity of the main building. It actually detracts from the structural integrity of the structure since anything permanently attached to the structure becomes part of the seismic weight during an earthquake, which results in higher lateral forces on the building. The view from the observation deck in the tower of City Hall. “Height to the Architectural Top of the Building including spires, but not including antennae, signage, flag poles or other functional-technical equipment. This measurement is the most widely utilized and is employed to define the CTBUH rankings of the 'World's Tallest Buildings.'" Are there other countries designing buildings with spires? It seems like something the U.S. fancies, but isn't terribly popular elsewhere. What are the origins of the Philly rowhome? What is a middle neighborhood? Yes, other countries use it as well. In fact, in terms of usage, the highest usage according to the Council for Tall Buildings and Urban Habitat (CTBUH) are as follows: United Arab Emirates has the highest average spire or vanity height, followed by China, then the U.S., and then followed by other countries combined. 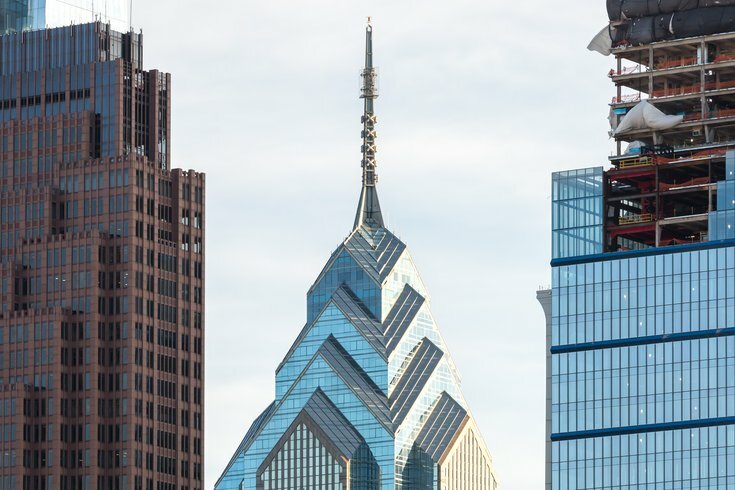 Happen to know what the purpose of the spire is on the new Comcast building? No, I don’t. However, one thing I notice about the spire on the new Comcast building is that it feels like an integral part of the main building structure rather than an appendage. How do architects generally feel about the use of spires? Some of the most popular modern buildings -- like the new World Trade Center -- use them, after all. That’s a good question for an architect. As long as the legally measured height of tall buildings includes the height of non-habitable sections such as spires, my guess is that architects will continue to use them, when they can, to maximize the height of their skyscrapers. Anything to add? What's "on trend" with skyscraper design right now? Or what might you predict will be on trend, based on what students are doing? More sustainable construction – LEED certified skyscrapers. 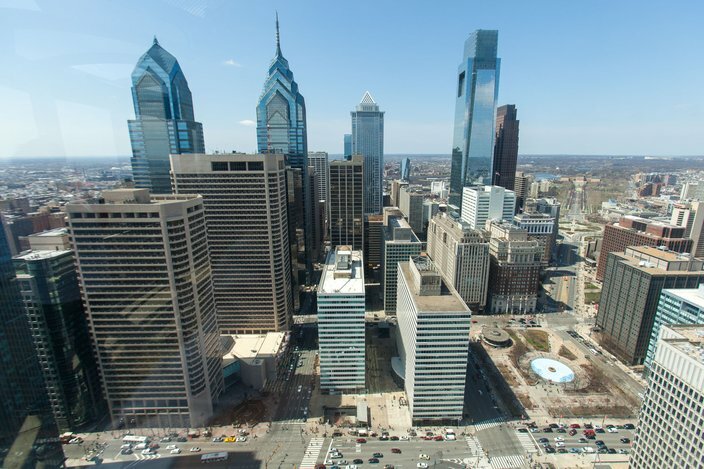 The Comcast building is aiming for a LEED Platinum certification. Plus, use of wood in high-rise buildings with the recent introduction of Cross-Laminated-Timber (CLT) into the European and American markets. That helps to take care of the fire rating issues.